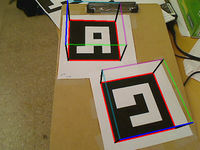 In computer vision, a fiducial marker is a known object which can be easily identified. BoofCV provides built in support several different fiducials, all of which can be easily printed on paper. Applications are provided for creating your own postscript files. BoofCV library provides a single high level interface for detection, identification and pose estimation of all fiducials. Alternatively you can use the low level API and access fiducial specific information. 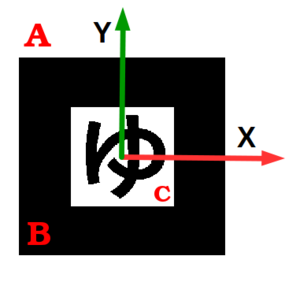 There are two types of fiducials supported in BoofCV, square and calibration targets. Square fiducials encode a large number of unique patterns inside a black square box. These targets can be uniquely identified and provide a full pose estimate. Calibration targets fiducials are repurposed targets used to calibrate cameras. Calibration fiducials tend to provide very accurate pose estimation when close to the camera, but can have difficulty as they move away. There are two significant disadvantage for calibration targets. 1) They don't provide a unique ID. 2) Most patterns are not fully orientation invariant. You can see the lack of rotation invariance when it suddenly flips 180 degrees. Speed to detect multiple fiducials in a 640x480 image on a Intel Core i7-2600 3.4 Ghz. Unique max number of unique targets it can identify. Pose indicates if a full 6-DOF estimate is found or subset. Infinity symbol really means "lots". Binary fiducials can be configured with different inner grids. Total number of unique fiducials will very from 32 to 1.15e18 for a 3x3 or 8x8 grid, respectively. 3 How Do Square Fiducials Work? To get a list of commands and see how to track other types of fiducials just enter the command with no arguments. The following is a printable documents for all the types of fiducials supported in BoofCV. Print these to get started quickly, but creating your own is also easy. For square fiducials, a convenient command-line application is provided which can create printable postscript (.ps) documents which contain one or more fiducials on them. For calibration targets, prefabricated patterns are provided which can also be printed. Fiducials can be made using the applications.jar you created earlier. Usual for complete instructions just enter in the classes name with no arguments. That will create a printable fiducial.ps file that encodes the number 284 in a 4x4 square that's 12 centimeters. The number of elements which compose its inner grid and the width of the outside border are both configurable. By default all code assumes a 4x4 grid and 0.25 fractional border width. This produces a reasonable compose between detection robustness and the number of features it can encode, which is 4096. A fiducial can be easily created from any image using "applications.jar". This will create a pattern which is 12cm wide and encodes the image contained in 'pentarose.png'. The output will be saved in "fiducial.ps" file. Not feeling very creative or just want to see some example images? Several patterns are contained in "data/example/fiducial/image/patterns/". How Do Square Fiducials Work? The origin of the fiducial is at its center with x and y axises as shown. 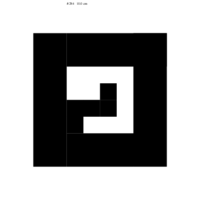 The fiducial itself can be divided into three regions, a) white outside region which provides contrast against the black border, b) black square border, and c) encoded image or pattern. All square fiducials share a common code base. 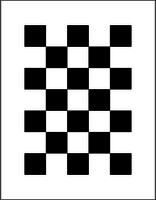 A target contains a black square of constant width and inside there is an image or pattern. The pattern is used to uniquely identify the fiducial and determine its orientation. A full 6-DOF pose is estimated from these fiducials. These targets are inspired by ARToolkit, but the code is not a port and was developed from scratched. Step 1: Thresholding is performed using either a user configurable fixed threshold or locally adaptive threshold, fast and robust respectively. While slower robust can handle variations in lighting much better. Step 2: Contours are found from the binary blobs using Chang 2004. Step 3: The contour is converted into a polygon using a split and merge technique. Only four sided polygons are accepted. Step 4: The crude polygons are refined to subpixel accuracy. This is done by iteratively refining the estimate of each side's line. That is done by computing the difference of line integrals tangential to each line, then using their intensity values to compute a weighted line. Step 5: The four corners are now known to a high level of precision, these are then used to compute a homography which is then used to generate an undistorted square image of the inner pattern. This pattern is then used by the specific algorithm to identify a known target or compute a number. Noisy images are rejected here. Step 6: The pose is computed through a combination of P3P and P4P techniques. The one with the smallest residual error is selected. Then non-linear refinement is performed. Care is taken to reduce the effects of head on small fiducials, which have a degenerate geometry. In that situation significant changes in orientation result in only a small change on the image. That is handled by placing a greater emphasis on reprojection error caused by orientation. NOTE: Steps 2 to 4 are carried out by the black polygon detector. The square binary fiducial encodes a 12-bit number, 4096 possible values, using a binary pattern. The number is encoded by breaking up the inner portion into 16 squares in a 4x4 grid. Three of the corners are always white and one black. This is how it resolves an orientation ambiguity. 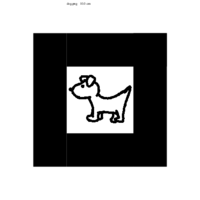 When an image is loaded into this type of fiducial it is first converted into a square image then down sampled into a low resolution image and encoded efficiently . When processing a video feed and a fiducial is detected the pattern is undistorted as usual. Then the hamming distance between the just observed pattern and all the known patterns is found. The pattern with the best score within tolerance is accepted. All of these different types of fiducials can be used through a high level interface, *FiducialDetector*. FactoryFiducial is the easiest way to create instances of different fiducial types and it hides much of the complexity. Some detectors require additional information after construction. For example, square image fiducials require images be provided for each target it can detect. A sketch of how to process a single image is shown below. See the examples below for a more understanding of how to use these different types of fiducials. This page was last edited on 20 January 2018, at 10:50.